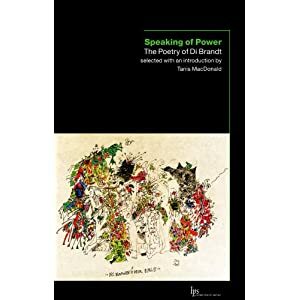 Speaking of Power - The Poetry of Di Brandt - selected with an introduction by Tanis MacDonald. Wilfrid Laurier University Press. Waterloo, ON. 2006. "There is what Don McKay calls "poetic intention" to the beauty and ugliness, joy and suffering, of everything around you." Di Brandt observes, absorbs and explains our world to us in language that is both instantly recognizable and an assertion of a particular power. Di Brandt's Afterword in Speaking of Power is an elegant, heartstrong and loving manifesto. A declaration of the hows and whys of the real need to create poetry. The Afterword alone is worth the price of admission. Speaking of Power is from the excellent Wilfrid Laurier University Press — Laurier Poetry Series. Each of the Laurier Poetry Series titles is a treasure. These volumes give the reader an educated introduction to each poet. In Brandt's case Tanis MacDonald handles the selection and introduction with aplomb. What is clearest in this short volume is that Brandt's clarity of vision and pure resonant voice are worth revisiting. I love an honest poem and Di Brandt is all over that. I've admired her work for a long time. This little volume, Speaking of Power, is a good introduction to those who haven't read Di Brandt. For those of us who have it is a good reminder of all the things the rest of us can aspire to. SHE: Poems inspired by Laozi, with ink drawings by Lin Xu (Brandon, MB: Radish Press, 2012). Chapbook. The Lottery of History (Brandon, MB: Radish Press, 2009). Chapbook. questions i asked my mother (Winnipeg: Turnstone Press, 1987). Di Brandt's poetry has been adapted for television, radio, video, dance, sculpture and theatre. questions i asked my mother was a bestseller in Canada. Di Brandt's poetry has been the subject of numerous scholarly essays and monographs. So this is the world & here I am in it (Edmonton: NeWest Press 2007). Dancing Naked: Narrative Strategies for Writing Across Centuries (Toronto: Mercury Press 1996). Wild Mother Dancing: Maternal Narrative in Canadian Literature (Winnipeg, MB: University of Manitoba Press 1993). Wider Boundaries of Daring: The Modernist Impulse in Canadian Women's Poetry (Waterloo, ON: Wilfrid Laurier University Press 2011), ed. with Barbara Godard. Re:Generations: Canadian Women Poets in Conversation (Windsor, ON: Black Moss Press 2006), ed. with Barbara Godard. Awakenings: In Four Voices," a collaborative poetry/music audiorecording (CD) with Dorothy Livesay (posthumously), Carol Ann Weaver and Rebecca Campbell (2003). Emily, The Way you Are," a one woman chamber opera about the life and work of Emily Carr, with musical score by Jana Skarecky, premiered at the McMichael Gallery in Kleinburg, ON, in 2011, featuring mezzo soprano Ramona Carmelly and the Talisker Players directed by Gary Kulesha. Coyotes do not carry her away, a musical setting of Di Brandt's poems, by Manitoba composer Kenneth Nichols, commissioned by the Brandon Chamber Society and premiered at Brandon City Hall in 2012, featuring Naomi Forman (soprano), Catherine Wood (clarinet) and Ann Germani (harp). Watermelon Syrup: A Novel with Annie Jacobsen and Jane Finlay-Young (WLUP 2011). Gerald Lampert Award for "best first book of poetry in Canada," for questions i asked my mother. McNally Robinson Manitoba Book of the Year Award for Agnes in the sky. CAA National Poetry Prize for Jerusalem, beloved. Foreword Gold Medal for Fiction for Watermelon Syrup. Gabrielle Roy Prize for "best book of literary criticism in Canada," with Barbara Godard, for Wider Boundaries of Daring: The Modernist Impulse in Canadian Women's Poetry. Brandon University President's Medal for Research, Teaching and Service 2011. Canada Research Chair in Literature and Creative Writing, Brandon University, 2005-2011. SSHRC Research Fellow, University of Alberta, 1996-1998. Research Excellence Award, University of Windsor, 2006. Gold Medal for Exceptional Service to Brandon University, 2009. Research Fellow, Ledig House, New York, 2004. Research Fellow, Hawthornden Castle, Scotland, 1999. Research Fellow, Chateau de Lavigny, Switzerland, 2001. Research Fellow, Fundacion Valparaiso, Spain, 2006. Governor General's Award for Poetry nomination, for questions i asked my mother. Governor General's Award for Poetry nomination, for Jerusalem, beloved. Griffin Poetry Prize nomination, for Now You Care. Trillium Ontario Book of the Year Award for Now You Care. Pat Lowther Award for "best book of poetry by a Canadian woman, nomination, for mother, not mother. Pat Lowther Award nomination,for Jerusalem, beloved. Pat Lowther Award nomination, for Now You Care. McNally Robinson Manitoba Book of the Year Award nomination, for So this is the world & here I am in it. McNally Robinson Manitoba Book of the Year Award nomination, for Wild Mother Dancing: Maternal Narrative in Canadian Literature. McNally Robinson Manitoba Book of the Year Award nomination, for Walking to Mojacar, with French and Spanish translations by Charles Leblanc and Ari Belathar. Di Brandt served as Poetry Editor at Prairie Fire Magazine and Contemporary Verse 2 during the 1980s and 90s. She also served as Manitoba and Prairie Rep at the League of Canadian Poets National Council and the Writers' Union of Canada National Council for several years during these same years.